Which DVD Ripper is the best DVD Ripping software for Windows in 2016? The article gives you the reviews about the top 5 best DVD Ripper programs for Windows (Windows 10 included). You can take it as reference to choose the proper DVD Ripping tool by yourself. If you collect tons of DVD discs at home, there is no enough space in your shelf, it’s better to backup DVD to a NAS with huge storage; don’t want your loved DVD discs to be scratched by naughty children and destroyed by times of playing in disc players, it’s necessary for you to purchase a DVD ripper to rip DVD to your computer or save in other places; you have some media players that can’t play or stream the DVD discs directly, the best way is to use a DVD ripper to rip DVD to digital video formats your device supports. After testing almost all the DVD rippers in the market, We’ve rated and ranked the 5 best DVD rippers available on the market today. At the end of our analysis, Brorsoft DVD Ripper, Magic DVD Ripper, DVDfab DVD Ripper, WinX DVD Ripper, Aiseesoft DVD Ripper earned the top five spots on our side-by-side comparison. You can choose the best DVD ripper for yourself according to the review. Not any other DVD Ripper can do with all kinds of DVD sources: protected and unprotected DVD disc, Video_TS Folder, ISO and IFO files. Regarded as the best DVD Ripping software on the market, Brorsoft integrates DVD Ripping, Conversion, and Backup. The best DVD Ripping program provides movie lovers with the easiest and fastest way to convert any DVD movies to any prevailed video and audio formats including AVI, MP4, WMV, MOV, FLV, MKV, 3GP, MPEG, TP, TRP, HD AVI, HD WMV, HD MOV, etc. with high quality. If you want to convert DVD movies for playback on your portable device like iPhone 6, iPhone 6 Plus,iPad Mini , iPad Air, Apple TV, Nexus 10, Nexus 7, Samsung Galaxy Tab S2, Microsoft Surface, Kindle Fire HDX, Xbox One, Xbox 360, Roku 3, etc., this DVD ripping software for Windows is undoubtedly the best choice. You just need to select the device as the output format and you can rip DVD to fit your device without further settings. Moreover, Brorsoft DVD Ripper makes 1:1 copy of original DVD Disc without quality loss with all audio streams, subtitle tracks, extras, etc and also help you direct copy main movies from DVDs. For the short time it takes to convert the movie with the help of CUDA/AMD GPU acceleration, and you will get hours of enjoyments. It’s simple to use and well worth the investment. Magic DVD Ripper detects and imports DVD from optical drive automatically. If you have a DVD backup on hard drive, you can select and load the VIDEO_TS folder instead. Magic features adequate common video formats (MP4, AVI, WMV) for average users, but 32 presets are not sufficient for Android users, since there’s only 1 format for Android tablet – the Kindle Fire. As Galaxy Tab owner I would like to put DVD movies onto the 10.1′ tablet and I need a costumed format to ensure smooth playback on my device. Magic DVD Ripper failed to keep the original aspect ratio, and gave softer image. Magic DVD Ripper serves as a nice tool for copying and burning DVDs though. DVDfab has a comfortable blue interface, but it is not user-intuitive as Brorsoft when it comes to operation. DVDfab DVD Ripper is good for those who would like to have external subtitles and 2 audio languages (MKV only), or those who want to rip a DVD to iPad MP4 and MKV at one time- this app queues up your conversion tasks and it pops up settings/queue box each time a chapter is selected (this makes the operation kind of misleading). There’re some presets for Android smartphones and tablets, and you’re allowed to custom your own format to utilize the screen of your tab. Overall, DVDfab is a nice choice for ripping DVD to MP4/MKV with multi-streams. With decent decrypting capability, high quality video output and considerate backup solution and specific format templates for versatile PMP devices (iPad, iPhone, Apple TV, Xbox, PS3, Android tablets and phones, etc), Brorsoft DVD Ripper ranks top on the DVD ripping application list. Meanwhile Brorsoft provides excellent customer support service, including lifetime free upgrade of product and technical support. Users can contact the support staff via email for help and suggestion. The best DVD rippers have a wide array of features and tools that allow you to rip, convert, edit and more. Below are the criteria by which we rated and ranked these applications. Cost/Performance: Everybody wants to gain more with less money. Video Quality: Someone often uses the device to watch movie/video/tv shows, so the output video quality should be considered seriously. 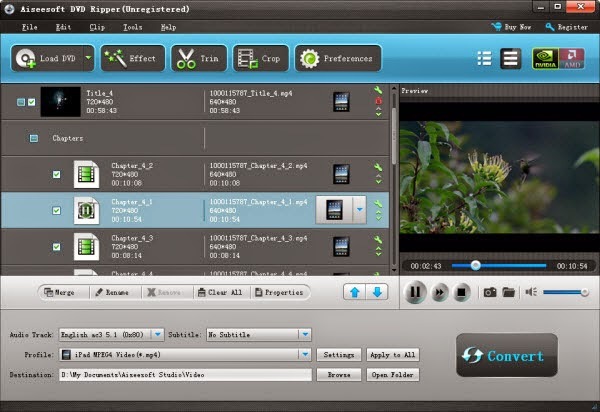 Top DVD Ripper output without any loss in the video and image quality of the exports. To enjoying the high definition video is of great pleasure. Or else, not only your eyes may get hurt; the annoying jumpy and mosaics will also bother you. Speed: Convert DVD often takes time, an hour DVD movie takes around thirty minutes to convert to MPEG-4 movie, if you have multiple DVDs to be converted, a high speed converter would be your best bet, or else, you will waste much time on the conversion, and your computer will be tied to the process. Quality of DVD: Sometimes, rip DVD to device according to the original DVD quality, or the types of the DVD to determine the ripped file quality. Easy to use: There are still many users knew little about computer, so complicated parameter settings will strain their brain, as a result, a application with simple interface and steps is the acceptable. Personal Demands: For example, someone just wants to convert part of the DVD video, or others want the special output video format like Apple TV compliant forms and etc. At the end of the day, DVD rippers are applications that set your movies from discs and allow you to have digital copies of the content that you’ve paid for. Editor’s Note: The Digital Millennium Copyright Act (DMCA) forbids circumventing copy encryptions contained on commercial discs. The DMCA makes no exceptions for circumventing these encryptions for personal use. DVDMedia Help does not endorse piracy or any other illegal activity.